The BMW Group and the ECKART Academy yesterday presented the 2018 Eckart Witzigmann Award, named after chef Eckart Witzigmann (ECKART) for sustainable enjoyment and culinary delights. Approximately 200 guests from sectors of internationally renowned gastronomy, culture and business celebrated the merits of Suzanne Cupps and Danny Meyer (Lifestyle), Astrid Gutsche and Gastón Acurio (Innovation), Christopher Kostow (Great Culinary Art) and the Union Square Greenmarkets (Creative Responsibility) in the Spring Studios in Manhattan. As a surprise, Günter Seeger, pioneer of Greenmarkets, also received the award. The 2018 Eckart Alumni Prize went to Alice Waters. ECKART 2017 presented at Palace of Versailles. Prize money for sustainable projects at high international level. Versailles/Paris. The BMW Group and the Witzigmann Academy welcomed the who’s who of international high-end gastronomy yesterday to the Palace of Versailles, outside of Paris. The two partners presented the international Eckart Witzigmann Award (ECKART) for outstanding services to the culinary arts, nutrition and responsible use of resources together for the sixth consecutive year. 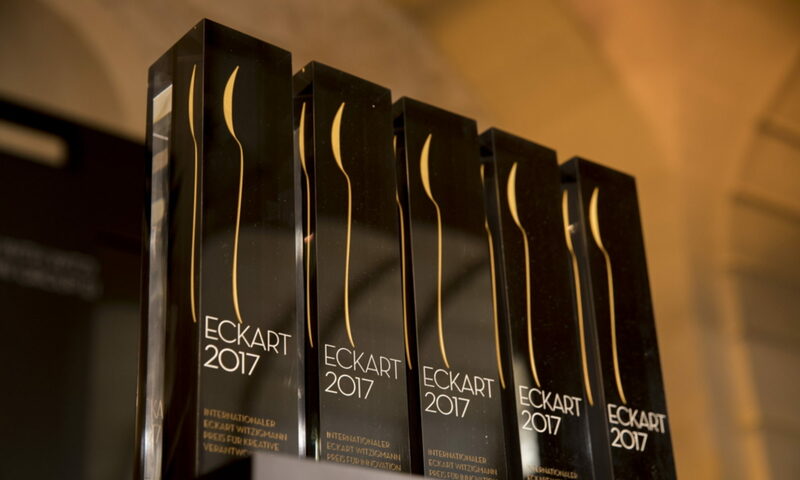 For the first time, the ECKART was endowed with €50,000 of prize money for each category, to reflect the prestige and importance of the award among top international culinary prizes. Award ceremony of the ECKART 2017 in Versailles on 21 September. Paris. Alain Ducasse meets Eckart Witzigmann in the run-up to the award of the ECKART 2017 in Versailles on September, 21. Munich. The international world of haute cuisine gathered at BMW Group Classic in Munich last Tuesday for a special occasion: “Chef of the century” Eckart Witzigmann presented the ECKART 2016 named after him to Dominique Crenn, Andreas Caminada, Sebastian Copeland and the Munich Viktualienmarkt. An honorary award was also received by Julia and Tobias Moretti. In just over ten years, the International Eckart Witzigmann Award, ECKART for short, has established itself as one of the highest accolades for outstanding achievements in the art of cookery and fine dining. This was the fifth year the award has been presented in conjunction with the BMW Group. Munich. BMW Museum hosted a grand gala event for the presentation of the Eckart Witzigmann Award 2015 on Tuesday. “Chef of the century” Eckart Witzigmann paid tribute to fellow chef Massimo Bottura, the Troigros family of restaurateurs and the father of Nordic cuisine, Claus Meyer. Awards were also presented for contemporary German gastronomy, represented by three of its outstanding exponents: Ulrike Thieltges, Klaus Erfort and Melanie Wagner. The Eckart Witzigmann Award was celebrated on Wednesday with a grand gala event at BMW Museum. “Chef of the century” Witzigmann paid tribute to fellow chefs Shuzo Kishida, Heinz Reitbauer, Sr. and Heinz Reitbauer, Jr. The ECKART 2014 for “Creative Responsibility and Enjoyment” went to surfing legend Jon Rose and his project “waves 4 water”, while singer Mick Hucknall was recognised for his services to “Art of Living”.